What is Coaxial Gearbox (Gear Reducers) ? A coaxial gearbox (gear reducers), also referred to as an inline gearbox (speed reducers) drive shaft and the output shaft are on the same rotation axis. Coaxial gearboxes are usually in the form of spur gears. Spur gears come in different versions. With a single spur gear the axes of the individual spur gears are parallel to each other and fixed. The direction of rotation of the input shaft and the output shaft is specified by the number of gear pairs and can be in the same direction or in the opposing directions. Even if single spur gears are not coaxial gearboxes in principle, concentricity can be achieved using two pairs of gear wheels with a total of four gearwheels. Two of the gearwheels are arranged parallel on one axis when doing this. One special type of coaxial gearbox is the planetary gearbox. Unlike a single spur gear, with a planetary gear not all axes are fixed. A spur gear also has internal teeth. With a planetary gear reducers, several spur gears run between a gear with internal teeth and a gear with external teeth on a concentric orbit. This is how planetary gears acquired their name. The coaxial arrangement of the input shaft and the output shaft is already given by the specific design with these coaxial gearboxes. 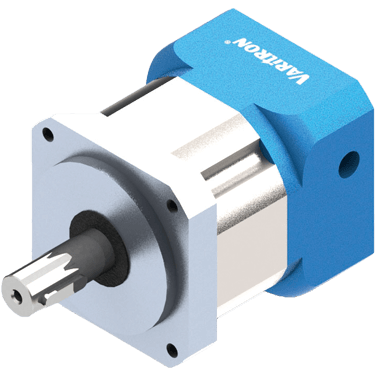 Another special feature of the planetary gearbox is that not all of the spur gears have to rotate around their own axis in order to transmit a torque. The spur gear with the internal teeth is usually fixed, which results in the drive shaft and the output shaft rotating in the same direction. Compared to single spur gears, planetary gear reducers have an extremely good power density. This achieved by the fact that the torque can be distributed to the orbiting spur gears and therefore several tooth engagements. This means that an extremely compact design and extremely high efficiency can be achieved. Multi-stage ratios can also be achieved by means of single serial arrangement in the same spur gear with internal teeth. The overall multiplication factor results from the product of the individual rations of each planet stage.